When they’re great, the correct pair of glasses perfectly complements your face and seamlessly facilitates your experience of the visual world. When they are not the right prescription or hastily chosen, glasses can be uncomfortable, cause headaches, detract from your appearance, and become a nuisance that distracts from everyday life. A few easy tips can help you choose glasses that look and feel so great that you forget they are there. Glasses come with a variety of lens types, and manufacturers continue to make advances in lens technology. Today, most lenses are actually made of plastic, not glass. Plastic tends to be lighter and less damage-prone than more traditional glass lenses. One of the most popular types of lenses are made of polycarbonate. These lenses are perfect for active individuals or children, because they are impact-resistant and fairly durable. Polycarbonate lenses also block ultraviolet rays, protecting your eyes from sun damage. Those who want further sun protection may choose photochromic lenses, which change from clear to a darker tinted shade when exposed to UV light. If you have a very strong prescription, you may have resigned yourself to thick lenses. But newer high index plastic lenses provide a lighter, thinner lens for strong prescriptions. Aspheric lenses also tend to be thinner and flatter because of their unique surface curvature, which also corrects for minor visual distortions. In the past, bifocal lenses were easy to spot by the clear line delineating the two sections of the lens. Today, multifocal lenses -- also known as progressive lenses -- look indistinguishable from regular lenses. Bifocals are commonly needed by individuals over 40 who have difficulty focusing on near objects, such as reading a book. 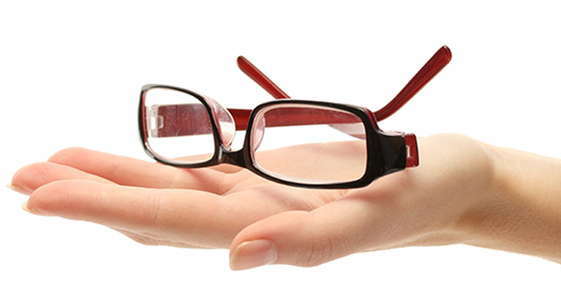 Trifocal lenses add an additional section to enhance your ability to see objects about an arm’s length away. These objects fall in an intermediate zone that may be challenging to see with bifocal lenses. After discussing the lens material and your potential need for multifocal lenses, your optometrist can advise you on the need for lens coatings. Many people opt for scratch-resistant coating, which adds a further layer of protection on the lens. Ultraviolet coating may also be a good choice to prevent sun damage. Also remember to ask your eye doctor about tinted lenses, which can improve ability to detect contrast or certain colors. With careful consideration, you can find the perfect pair of glasses to frame your face and improve your vision. Review your options with your optometrist to get a professional opinion about what features are best for you. If you make the right choice, your glasses will become an unnoticeable addition to your everyday look. Vision Service Plan (2012). Types of lenses. All About Vision (2012). Eyeglass basics.